​The body, the place of the body— Clark under his white spike and Lewis under that odd marble stump near the Grinder house. But the old journals. Ah, yes. In the Journals, even Cruzatte lives, matched there to the moment of his intrepid act— when in that sudden squall the white pirogue heels over under its luffing sail, he cuts the halyards, then, still off balance, levels his charged piece at panicked Charbono to bring him to himself but just in time to recollect the tiller. In crabbed scrawl on the yellowed page, always they end swamped to the gunwales, pulling for shore. Naugatuck River Review published a version of "Epitaph" under the title "River: 21" (Summer, 2009). Contemporary Haibun Online reprinted “Epitaph” (January, 2015). 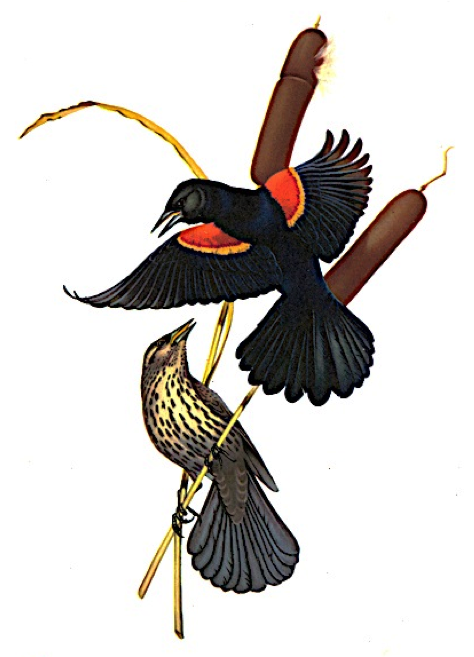 Image: Red Winged Blackbird – Plate 37, John James Audubon. Public domain.